Mascots and Muskets and Bears, oh my! 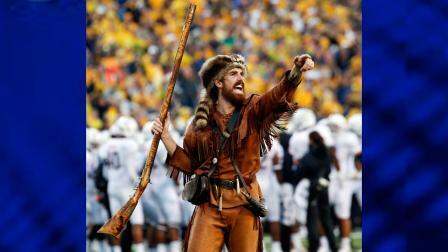 West Virginia University’s Mountaineer mascot, Jonathon Kimble, recently shot a bear with the same musket he totes on the football field. It apparently isn’t just a prop – it’s a real weapon. Kimble made a video of the hunt with friends and family, and WVU ordered him to stop hunting with it. He says it was done as part of a tradition. On the video, Kimble yells “Let’s go Mountaineers!” after downing the treed bear. Afterwards, he tweeted a photo of himself aside his first bruin; probably not a tradition that dates back too far. “While Jonathan Kimble’s actions broke no laws or regulations, the university has discussed this with him, and he agrees that it would be appropriate to forego using the musket in this way in the future,” WVU spokesman John Bolt said. But some WVU fans stood behind Kimble on Friday. Kimble was selected from 13 applicants earlier this year to represent WVU as their mascot.